How to assemble your MACSPlex Mix? Our MACSPlex Mix products allow you to combine individual analytes within one application category according to your needs. This option is available for the MACSPlex Cytokine Kit, human, and the MACSPlex Cytokine Kit, mouse, but will be extended soon. Because each single reagent has a specific fluorescence property, the combination of analytes is only possible within one defined application category. After choosing your first analyte, compatible reagents will be visible by clicking on the product name on the product page. Human and mouse specificities cannot be mixed within a single experiment. 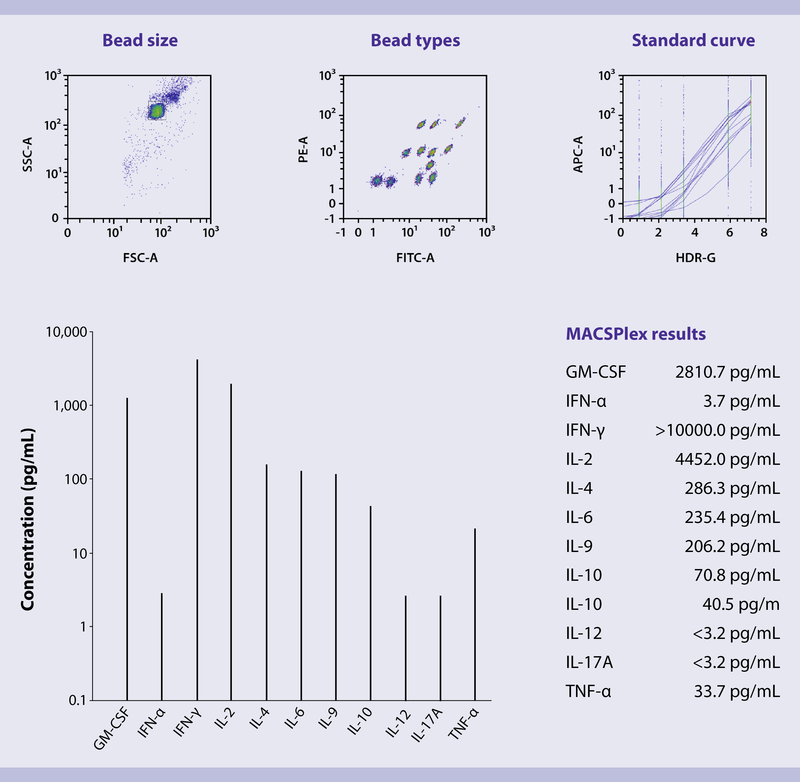 MACSPlex assays are based on the fluorescent detection of MACSPlex (MPx) Capture Beads, which display defined fluorescence properties that can be identified using standard flow cytometry techniques. MPx Capture Beads contain a cocktail of various fluorescently labeled bead populations, each coated with a specific antibody that reacts to one analyte. For some kits a labeling step with biotin-conjugated antibodies is added to enhance signal intensity. Finally, the detection reagent leads to a signal that is measurable by flow cytometry. Please find kit-specific adaptations of the technology in the gallery tab of the respective product page. 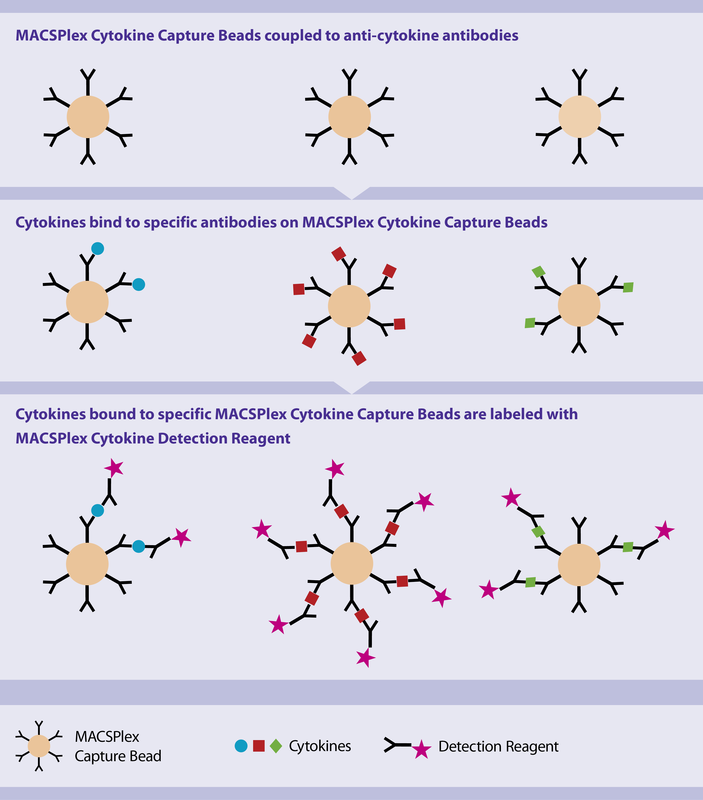 Samples containing unknown levels of analytes are incubated with the antibody-coated MACSPlex Capture Beads, and analytes bind to the specific antibody. A detection reagent, composed of a cocktail of APC-conjugated antibodies specific for the analytes, is added.Consequently, sandwich complexes are formed between the MACSPlex Capture Bead, the analyte and the detection reagent. These complexes can be analyzed based on the fluorescence characteristics of both the MACSPlex Capture Bead and the detection reagent. Standards of known quantities of given analytes are provided with the kit and are used for the quantification of the analytes within the unknown samples. For MACSPlex assays a flow cytometer with a blue (e.g. 488 nm) and a red (e.g. 635 nm) laser with the capability to detect FITC, PE, and APC is necessary. 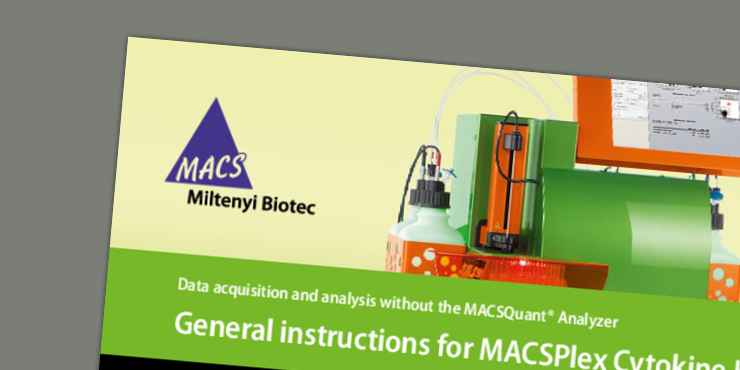 When using the MACSQuant Analyzer 10 or MACSQuant X, our MACSplex Kits can be combined with fully automated Express Modes. By this, an automated gating strategy to populations of interest will be applied and the gates will be automatically adjusted for each data file individually to achieve optimal results. Furthermore, a one-click batch analysis of all samples belonging to one experiment can be performed to directly compare your data. The concentrations of each analyte will be presented as an exportale table as well as a ready-to-publish graph. After singlet beads are identified, color-coded MACSPlex bead populations are automatically identified by their fluorescence properties in the PE and FITC channel. Standard curves for each investigated cytokine in the unknown sample are generated. The median of the APC fluorescence of each capture bead population gives the concentration of each cytokine in the unknown sample. Results are displayed as a graph and as absolute numbers. ExpressModes are compatible with the MACSQuant Analyzer 10 and MACSQuant X instruments and with the MACSQuantify™ Software already installed on your MACSQuant Analyzer. For the required software version, please refer to the table above. 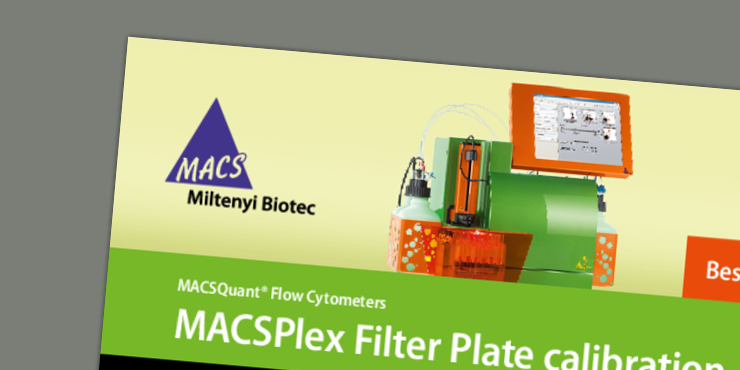 For all users running MACSPlex assays on a different flow cytometer, subsequent analysis can be performed on your computer. For this, you can use our Flowlogic™ Software in combination with the Beadlogic™ Add-on specifically developed to analyze multiplex assays. 30-day trial versions are available for both Flowlogic Software and the Beadlogic Add-on. Additionally, third-party software can be used for analysis.